Thomas Hardy’s Far From The Madding Crowd is a classic novel first published in 1874. It is the story of Bathsheba Everdene and Gabriel Oak. The book is set in nineteenth-century England in the fictional county of Wessex. Bathsheba transcends gender roles. She is a young woman who shows confidence and competence, often to the surprise of the book’s other characters. Upon the death of her uncle, Bathsheba inherits a large farm. She forgoes choosing a male farm manager and instead decides to run the entire operation herself. Though initially met with skepticism, Bathsheba’s proves herself to be strong and capable, and habits lead her to success. Most of the narrative consists of Bathsheba being wooed by three different men. Oak, who is meant to elicit the most sympathy from the reader, is stoic and is always in control of himself. William Boldwood is a prosperous farm owner who is outwardly a paragon of respectability. Frank Troy is an amoral adventurer who is skilled at manipulating his romantic interests. As the story progresses, Oak loses the farm that he owns, falls on hard times, and he eventually goes to work for Bathsheba. Though she respects him, she does not love him. He watches the other two men romance her as he exhibits calmness and patience. When she marries the irresponsible and unethical Troy, he watches as the adventurer begins to ruin Bathsheba emotionally and financially. There is a lot going on in this book. The characters are so well drawn that they are a pleasure to read about. I could devote an entire post to any of the four major characters. Bathsheba is a great literary creation. She is simultaneous strong and vulnerable. She is portrayed as an intelligent and capable woman who runs into misery by falling in love with the false charmer Troy. She is self-aware and understands that her emotional reactions are causing her self-harm. Boldwood is another well crafted character. He is a bastion of society. Though he is stiff and serious, he initially acts honorably and displays kindness to others. Despite his outward strength, he falls apart when Bathsheba chooses Troy over himself. Later, when Troy disappears and is assumed dead, he begins to act obsessively and becomes terribly overbearing in his treatment of Bathsheba. Troy, though mostly petty and wicked, reacts oddly when a girl whom he took advantage of in the past, dies, partially as a result of his actions. Uncharacteristically, he descends into a spiral of regret and self-recrimination. Though I found Oak to be a little simplistic and too good to be believable, he is interesting to read about. Though he loves Bathsheba, he is rejected by her and must watch as she marries a scoundrel. Yet, he shows remarkable sereneness and strength of character. In the end, his character is integrated into one of the book’s major themes; that long term, realistic love is far superior to quickly developed passionate love. In addition to the impressive characterizations, there is something special and important about Hardy’s descriptions of natural scenes. The novel is packed with images of nature. Diverse landscapes, plants, animals, weather events and many more natural features and events are described in great detail using grand prose. These descriptions are often related to the plot or particular characters in symbolic ways. One very distinctive passage takes place when a terrible storm strikes the farm. Troy and the farm workers are passed out drunk while Bathsheba and Oak struggle to protect the newly harvested crops from the deluge. The imagery is described in magnificent prose. This novel is filled with such passages. The prose is so well written. As these descriptions are often tied to the novel's themes and underlying messages, the book is pulled together in an aesthetically magnificent way. There is so much that is good about this novel. There are interesting and important themes relating to gender, passionate love verses long term love, urban verses rural attitudes and more. The characters are skillfully crafted. The story is interesting and engaging, to name a few more of the work’s virtues. This book rightfully deserves to be called a classic. Great review of a great book by one of my favorite authors. It is interesting how Thomas Hardy was able to create such compelling female characters. From Bathsheba whom you accurately characterize here to others like Eustacia Vye, Tess, and Sue Bridehead, he created fascinating and strong women. Thanks for sharing your thoughts about this fine novel. Although I've read some work by Thomas Hardy, I had not heard of this book before--it sounds incredible! Excellent commentary, Brian Joseph. This novel sounds like a true classic. Thanks Suko - If you liked other Hardy books I think that you would like this one. Thanks James. The only other Hardy novel that I read was Tess of the d'Urbervilles Tess was indeed an extraordinary character. I need to read more Hardy. I read the book some time ago and have seen maybe two versions of the movie. It is a haunting read. Hi Harvee - There is something haunting about it. I found that was also true about Tess of the d'Urbervilles . I think one reason for this is Hardy's prose. Hi Jillian - I think that you would like Hardy. I have read this book and Tess of the d'Urbervilles. Both books had strong feminist themes. 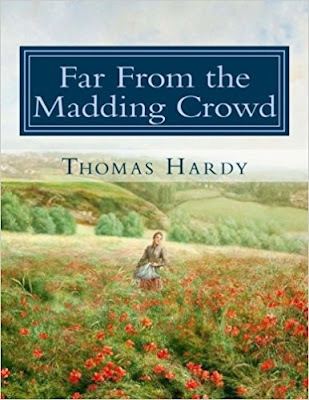 Hi Brian, I have been wanting to read Thomas Hardy for some time and now thanks to your excellent review, I am going to choose Far From Maddening Crowd. I love books with well drawn characters, great writing and strong female protagonists and sounds like this book has all three. I have a difficult relationship with Hardy and with this book in particular as I had to study it for O Level, a process which sucked all of the life out of it for me. Nevertheless, it's good to see Hardy getting some coverage across the blogosphere. I can fully understand why his novels have stood the test of time. I'm glad you enjoyed it so much. As you say, it's a novel with a strong sense of place. Hardy's descriptions of the natural world are just magnificent. This book & The Mayor of Casterbridge, are my favourites. I felt sorry for Boldwood for awhile but then he just annoyed me! Hi Jacqui - It is such a shame that academic stridency ruins the enjoyment of books. Though I never had the experience, others have told me the same thing. Hi Carol- I have not yet read The Mayor of Casterbridge. As I have liked the Hardy books that I have read, I would like to read it soon. Hi Kathy - I think that you might like this book. Tess of the d'Urbervilles was also excellent but it was also very dark and disturbing. I confess: I've not read anything by Hardy, and I once heard from someone I respect that she would rather have a root canal than read anything more than her one Hardy experience. Well, your fine review has me poised to ignore the root canal warning and give Hardy a try. Well, I might not get to him soon, but he at least has moved to my bucket list from my root canal list. Thanks! Thanks Tim. I have read this book as well as Tess of the d'Urbervilles. I thought that Tess was excellent but terribly dark. Though bad things happened in this book, it was not as dark. This is a favorite and definitely my favorite from Hardy He wrote it when he was young and in love and provided the only happy ending of any of his novels. It seems BathSheba is very proud and the novel is a story of her humbling. She doesn't want the boring Gabriel but the exciting Troy. That is such a familiar tale. The girls who are attracted to the "bad boys" over the "good" ones. I think as she saw Oak use good sense in maintaining her farm and how eventually everyone looked up to him for advice or to be rescued, her mind changed towards him. Great review! This was my introduction to Hardy. I saw a Masterpiece Theatre dramatization of this novel many years ago and was so intrigued by it, that I read the novel. That's when I got hooked by Hardy and have now read most of what he has written. Great review! I love this book and I want to read more of Hardy's work in the future. He seems to have been far more aware of sexism and gender issues than other writers of his age, especially male writers. I like the fact that Bathsheba is a well-rounded character. She's strong and independent but also flawed. I also love the 2015 film adaptation of this book. In fact, it's one of my favorite film adaptations of all time. Hardy really is a master, isn't he? I loved Far From the Madding Crowd and Tess, too, but wasn't as fond of The Mayor of Casterbridge when I read it in college. I'm sure it deserves another look now. Several of his other novels are on my wish list. Excellent review, Brian. This story can be indeed seen as that of a woman choosing the "bad", or damaging person of the "good" person. Hi The Readers's Tales. Indeed, as Sharon points out, this is a tale of the woman choosing the wrong man. I will allude back to our discussion on The Gate to Women's Country when I mention that I knew a few men who did the same thing and choose a reckless and damaging woman. Thanks Fred. I have read this and Tess of the d'Urbervilles. I need to read more Hardy. Thanks Kate. I really must watch the films soon. You are exactly right about Bathsheba's character. Thanks JoAnn. I also loved Tess of the d'Urbervilles. I need to give The Mayor of Casterbridge a try. The Return of the Native is another excellent one. The countryside actually is an unaccredited or unlisted character. Desperate Remedies is his first novel, and it's a thriller, with our hero trying to rescue a woman who is marrying a bad guy. I have only read one of Hardy's novels -- "Tess of the D'Urbervilles". That novel alone made Hardy one of my favorite authors! Since I know that you,too, have read it, you know how powerful a work that is. In fact, I would call it a feminist novel, as it attacks "the double standard" in romantic relationships, and thus, the whole basis of the patriarchy. I really need to re-read it, so that I can write a review for my literary fiction blog. "Far from the Madding Crowd" is another of those books (of which there are LOTS) that I've been wanting to read for the longest time.... Lol. I really feel for Oak.... Once again, in fiction as in real life, we have the case of a woman -- and an intelligent, totally capable one, at that -- falling for the wrong guy. This must have something to do with the female psyche, and I don't mean to put down my own gender in saying this. In fact, I have a book by Karen Horney, titled "Feminine Psychology", sitting on one of my shelves. Of course this is yet ANOTHER book I need to read! Lol. The use of nature imagery in a symbolic manner is typical of Hardy. It's also typical of the Bronte sisters. I believe the same technique might have been used by Hawthorne in "The Scarlet Letter", but again, I would have to re-read this novel in order to make sure. You know, classics are such absolutely WONDERFUL gifts to the world!! They are indeed immortal treasures! And the reason they are is that they touch the very core of what it means to be human. I really do need to balance my reading! As you know, I'm a VERY eclectic reader. But I feel I have to make SURE I read "Far from the Madding Crowd", as well as re-read "Tess of the D'Urbervilles"!! Alright, Brian et al ..... tell me which Hardy book is your favorite, the one everyone (including I) should read. It's hard to choose between _Far...Crowd_ and _The Return of the Native_, but let's go with _The Return of the Native_. Thanks for the recommendation Fred. Tim - The only other Hardy that I have read was Tess of the d'Urbervilles. I am tempted to say it was a better book then this one but it was so dark and depressing. I think that you would like this book. It is not as dark as Tess of the D'Urbervilles. It also contains feminist themes. I really wonder if women are attracted to destructive people more then men are. My personal experience may have biased my outlook as I have known a couple of men who have been attracted to destructive women. Feminine Psychology sounds interesting. Some of the nature descriptions that Hardy uses do indeed remind me of the descriptions in Jane Eyre. That was especially true of Tess of the D'Urbervilles. I agree with you about the Classics. They are treasures. I wish I had 100 years just to read all of Hardy, and then a few biographies of him, and just try to work out his views on and writing about women. In my view he's one of the most interesting "classic" authors on the subject of interpersonal relationships, not to mention on class. His prose is gorgeous, his descriptions of the natural world so well-done. I've got to put in a plug for one of his story collections, too: "A Changed Man." Great stuff. thanks for reviewing this book. I actually literally have the movie of FFTMC here right now because I wrote elsewhere about some Hardy movie adaptations--which are almost all very well done in themselves. Oh, and Hardy also just had a birthday--June 2!! Hi Citizen - Though I never read Tess of the d'Urbervilles I agree that Hardy is a great writer for all the reasons that you mention. His depiction of women characters on these books are extraordinary. I do not think that I have seen any films based on Hardy books. I will try to catch some now. Thanks for the link. Thanks Stefanie. After reading Tess of the D'Urbervilles. I also thought that this was going to be a dark book. I agree that it was not. Tess was very dark. There was also a horrible passage involving animals in Tess. I heard that was common in Hardy books. Nicely reviewed. I like the theme : "realistic love is far superior to quickly developed passionate love." Aha! Poor Oak. I guess in the recent movie he is played by Matthias Schoenaerts. I would love to see & read it. Thanks Susan. I also like that theme. I also want to see the film. Another one of those books that, lying upon our selves, I feel I should read. Thank you for bringing another of the classics to life Brian. You truly are inspirational, filling me with good intent as you do. I have read some of Thomas Hardy's poems - like "Neutral Tones," which is so bleak - but haven't gotten around to reading his novels yet. But the kind of characters you describe here are what I enjoy reading. This book is definitely on my list. Thanks for the good word Tracy. I would love what you thought of you read this. Hi Hila - I have not read any of Hardy's poetry. Tess of the d'Ubervilles was bleak. Though bad things happened in this book. It was mostly not bleak. Thank you for this review, Brian. I haven't read Hardy, and it's been a very long while since I read a classic. Now that I am on a break from work, this sounds like a classic I can try. Thanks Deepika - If you gave this a try, I would love to know what you thought. It sounds like you really enjoyed this one Brian and Bathsheba sounds like an interesting character and so do her suitors. I like the passages you shared, especially the first one. Hi naida - Both the characters and prose in this book were so well crafted. i always adored Hardy for his sympathetic and outstanding portrait of female characters .He is a specialist in remarkable characterization of such phenomenal characters. this story sounds simply beautiful and elegant. I totally agree with your beautiful description that gradually developed love is always deeper and stronger than quick one. Hi Bailli - In the two books that I have read, Hardy's depiction of women is extraordinary. I think that Bathsheba had to live through experiences and grow older, before she could realize the type of love that she eventually developed for Oak.